So, once again I’ve failed you, but I have a good reason this time I swear: my wife is pregnant. She’s been sick and I’ve been responsible for everything, which is completely eradicated any time I’ve had to do these letters. I’m going to try to rearrange my schedule so that I’m able to do some during the workday which will (hopefully) bring this long drought to a close. December 17, 1968. Fort Bragg, North Carolina. I’m afraid this is going to have to be short again – I’ve got KP tomorrow so must get to bed early. And I have to write the folks again – it’s been a week since my last one. Should write Bob too, but he’s going to have to wait. I went in and talked to the CO* tonight. I’ve been having a hell of a time catching him in up to now. Anyway, he assured me I would be able to take my leave when I wanted it. Remember the first sergeant said he thought I could but wouldn’t promise. I’m glad to know for sure. I could imagine what a mess it would create if it had to be postponed at the last minute! Actually we’re not [getting] our pre-deployment leave until February 11 – March 11, but the major said he’d let me go anyway. But – he probably won’t be able to get me the partial pay I wanted. He’s going to try though. He tried to talk me into waiting until February so I could get it, but I told him our plans were too far along to change them now. I imagine you’ve even ordered the announcements by now, haven’t you? In the letter I got from you today you said you didn’t care about a big wedding – “a judge would do just fine.” You know, you’re lucky you didn’t say that a month ago or I would have held you to it. But I guess there’s no way I’d do that when I know how much it really means to you. Say – do you know any more about Dale**? I haven’t had time to write him yet, but I thought maybe you’ve seen him around since I talked to you. I’m going to have to finish this up now honey. But I’m counting the days until I see you again. Only one month from tomorrow until I’ll be home. I have a feeling our wedding day will come almost too fast. We’ll have a lot to do in that week. PS. We found out that our battalion’s CO & XO*** who were in Nam with the other half of our battalion, were killed when their ship was shot down. I know this is getting out of control, but I plan on getting at least three weeks ahead by Monday. December 15, 1968. Fort Bragg, North Carolina. Sorry I haven’t written for several days, but I’ve been running around trying to get my Christmas shopping done, and I finally did it. Hope I can get them mailed tomorrow, and I hope they will get there in time. It may get pretty close now. I just hope yours gets there in time. Clay had CQ the other night and he ransacked the Major’s desk. He found copies of our sp5 orders, and it looks like I’m definitely going to get it. They’ve gone up to division for final approval and we should get them before too long (I hope). They’re supposedly backdated to December 1, which would mean more money before I came home which would be real nice. I’m getting kind of worried about what our money situation will be while I’m home. I haven’t been able to save much this month because of Christmas. And just next months pay plus a partial pay I’m going to get will still leave us pretty tight. The savings bonds I have at home will help, but a honeymoon and renting a room at the Sawnee will still cut it pretty close. Why don’t you check and see what a room for two weeks will run? That will give me some idea of what to expect. Also, I’m checking into getting a ride with a guy who lives in Minneapolis. It would take longer to get home but would save a lot of dough. I’m glad my folks seem to have come around to our side. I’m surprised Brian acted the way he did though. I can’t believe he was being serious. You must’ve caught him at a bad time or something. That’s all I can figure. He’s always thought you were the greatest, and I’m sure he didn’t mean to hurt you. Honey, do you realize that in a little over a one month we will be man and wife forever? That’s a long time, but I wish it were longer. I hope you talked your mom out of that second reception because I don’t want us to be too pooped to enjoy our wedding night. Won’t it be wonderful to be able to make love whenever we feel like it? And then go to sleep with you in my arms every night. And that’s not very far off. I love you Reet. PS. Sorry this is so short but it’s my last sheet of paper. The Sawnee was a hotel in downtown Brookings until the mid-70s. Mom and dad stayed were thinking about staying there after the wedding as, naturally, they weren’t too keen on staying with one of their parents in town after the wedding. The building is still standing today and houses a number of businesses. 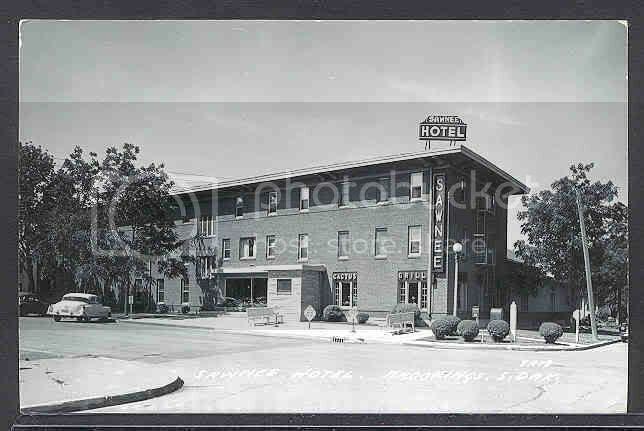 Recently the Brookings Historic Preservation Commission had a meeting to discuss putting the hotel on the national register of historic places, and they recorded quite an extensive history of the building, which you can find here (pdf). December 10, 1968. Fort Bragg, North Carolina. Dear Mrs. [my last name]! I should have known you’d put that on your return address one of these days. I can’t wait until that is your real name. I’m kind of partial to the idea. I can’t see why you’d want to trade your name for a common one like [mine]. But I sure won’t argue! I got two letters from you yesterday, which made my day. I think one came today too (I peeked in the mail room and saw one in my slot) but I couldn’t catch the mail clerk to get out. I’ll just have to wait until tomorrow. I still haven’t got your Christmas present yet. I just can’t find anything suitable. The things I’d like to get for you cost so much you would kill me. After this week is over I’ll have time to get into town and find the rest of my presents (I hope). So our wedding date got set back a day, huh? Well, with the rest of our lives ahead of us, I guess one day won’t make that much difference. But Reet, talk your mother out of that second reception, okay? One’s bad enough. I don’t mind the pictures afterwards, but after that we’re cutting out. I don’t mean run off 10 minutes after the ceremony, but I don’t want it to drag on and on either. You know what I mean, don’t you, honey? When are you ordering the announcements? The reason I ask is that I don’t know when I’ll know whether or not I made SP5. Not that it really makes that much difference, but if that’s what I’ll be when we’re married it would be nice to have it on the announcements too. But right now I don’t know if the orders will come through even before Christmas. I’d sure like to get it, but I’m not sure if I have enough time in grade yet. Say, in all the preparations for the wedding, don’t forget to go see a doctor about some pills, and I don’t mean pain pills. I mean those beautiful little things that take the worry out of being close, right? You know something honey – I love you. When I look at your pictures at the foot of my bunk I just want to reach out and hold you. I can’t believe I could be so lucky. But you know something else? It’s been a long time since I’ve felt lonely. You just seem too close for any loneliness. But I’ve got a lot of memories and a lot of hope for the future – for our future. And I’ve got a lot of love for you. So classes are finally over… and yet I still have school work. Not enough to keep me from doing letters though, so we’re back at it as of today. Now, I have the same common last name as my father and my wife and I went through a similar discussion when we got married. She had a pretty original last name that we both personally liked. Being a hip and progressive 21st century people we had a discussion as to whether or not she would take my last name. When she asked me my opinion I told her that I didn’t much care if she changed her name to Bob as long as she showed up at the church on time. One of her more radical college friends was aghast that she would take a man’s name. That was until my wife reminded her that she really only had the choice of taking her husband’s name or keeping her father’s. At that point it didn’t seem like such a big deal, though sometimes I do still refer to her by her maiden name which, as I said before, was a pretty good name. My last class is next Tuesday, so let’s just assume there won’t be any updates until the 14th, shall we? As many of you know, I’m currently earning my Master’s degree in teaching. And as all of you now know, it is the end of the semester and I’m am being assaulted by many deadlines that are monopolizing all of my free time. No post today but I will endeavour to deliver come Monday. I’m working right now, believe it or not. Only we don’t have anything to do, so we’re sitting around. There’s only about 30 guys from our battery here — everyone else is out in the field, and it’s snowing and cold. All our officers and the first Sergeant are out too. Our platoon sergeant is in charge, so he gave half of us yesterday off and half today. He just wants to make sure the CO doesn’t find out. Then he’d be up a creek. Since I was off yesterday I went to town shopping. Got most of it out of the way, but I may have a tough time getting to the post office to mail them. I still haven’t bought yours yet — can’t find anything around this hole I’d like to give you. But I’ll keep trying. The folks called last night to find out who I wanted added to the guest list. I gave them all I could think of off hand, but may want to add a few later on. I think it pretty well covered it though. 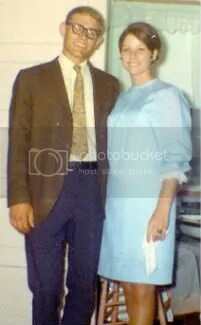 When I mentioned Jeannie, mom said she had thought of her but wondered how you’d like it. I told her it would be fine with you so she put her on the list. It is okay, isn’t it Reet? I hadn’t really thought about it. They also said you’ve been pretty busy what with school, work, and planning for the wedding. And a bad tooth on top of it. They said they had talked to you a couple days ago (Friday I think), but didn’t get to say anymore because Brenda wanted to talk, and never got back to it. How is your tooth? Hope it’s all taken care of by the time you get this. I’m sending you some pictures I took a couple weeks ago. Most of them won’t mean much to you but I thought I’d send them anyway. I sold a camera took them with, but I hope I can get another one so I can take some pictures when I get to Nam. I wish I had it to take pictures with while I’m home, but I needed money for Christmas gifts. I’ll borrow dad’s for us to use on our honeymoon. I guess I spoke too soon about doing nothing. This is Monday night now and I haven’t had time to write or even think about it. So I’m going to get this off now. Write again as soon as I can Reet.